Recently the Schott Foundation released a bleak report on the state of black male education. Only eight states graduate more than 70 percent of black non-Hispanic males from their high schools. Four states have a graduation rate between 60 percent and 69 percent. Twenty states (plus Washington D.C.) have graduation rates below 50 percent. Nationwide, the non-Hispanic black male graduation rate is 47 percent. Combined with the double-digit unemployment rates in our communities and the epidemic of foreclosures, we know that we are living a crisis of epic proportions. I'm familiar with the research on educational outcomes. The data indicate that our income levels influence how stable our homes are and how well our children perform in school. Income also influences how likely our kids are to spend time in jail. In addition, the data show that there are a variety of structural dynamics that also influence outcomes. Universal preschool works wonders, for example, as does the type of comprehensive needs-based program exemplified by the Harlem Children's Zone. On the other hand, there is no relationship between black cultural traits and educational outcomes. Having a child out of wedlock, for example, has little bearing on educational outcomes if the parent has a high income. I'm not saying that culture is unimportant, but we focus on it far more than the data suggest we should. Similarly, there is no relationship between civil rights-style marches and educational outcomes. Participating in a march to transform one's school, or to transform education in general, does nothing more than perhaps help you lose weight. Now, why do I mention these two issues? Because even though both the research and the Schott Foundation report clearly focus on structural solutions, and clearly state that the problem is not with black boys but rather with the structural conditions they find themselves facing, some of us are still focusing on some combination of civil rights activism and cultural reconditioning. The report says that "systemic disparities evident by race, social class, or zip code are influenced more by the social policies and practices that we put in place to distribute educational opportunities and resources and less by the abilities of black males." In recent weeks, the Revs. Jesse Jackson and Al Sharpton, as well as New York Times columnist Bob Herbert, have all independently called either for marches or for a new civil rights movement to combat the various trials that black people are facing (education being among them). And both Herbert and President Obama have repeatedly argued that black people need to be culturally reoriented to support education, as if we don't support it already. Talking about the Detroit march, Jackson argued that it was needed in order to bring attention to the crises Detroit is undergoing. No. People are very familiar with Detroit's problems. At best, a Detroit march would do no more than take the energy of people desiring change and siphon it off. Jackson needs the march more than Detroiters do. People like Jackson and Sharpton are doing what they do because this is the only way they can remain relevant. But with people like Herbert, it's another story entirely. He has done more than almost any other columnist to bring the condition of black people to light. He presumably knows the depth of the crisis, and unlike either reverend, he isn't hamstrung by his job to tout only one (weak) solution. So what gives? The language of personal responsibility has shunted many of us toward cultural solutions and away from political ones. For many of us, politics is akin to parlor tricks. But this approach leads us to evade politics and responsibility alike. Politics is messy; it is often ugly. But as taxpayers and citizens, taking responsibility for our communities should mean taking responsibility for how our tax dollars are spent — not simply for whether we choose to have children as single parents. I believe that we are also being blinded by what I'll call "the civil rights movement narrative." Narratives, told over and over again, have weight. They shape our understanding of history, our understanding of the present, our understanding of the future. In this case, the stories we tell repeatedly about events like the March on Washington have warped our ideas about how we got here and about where we go from here. 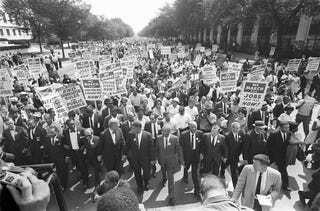 The civil rights movement began as a series of attempts by black people to deal with oppressive local conditions. Events like the historic march are lauded now, but 47 years ago, activists argued that it was taking valuable resources away from local organizing, resources that were never replaced. Emerging from these local attempts, the movement had one primary goal: to end state-sponsored racial discrimination. But when Martin Luther King Jr., influenced in part by both the student and Black Power movements, tried to take on poverty, the movement crumbled. If anything, we need to organize on a state-by-state level and push the local, state and federal governments to provide resources and needs-based programs that deal with structural inequities and poverty-related educational deficits, such as new schooling facilities and universal preschool. These are all programs that the Schott Foundation calls for. But more to the point, we need to begin to have broker-less conversations about what purpose education is supposed to serve. Perhaps a city like Detroit does not need a school system that simply trains people for jobs; instead, people could be trained to rebuild the city itself as well as for the responsibilities of political, social and economic citizenship. Now, what I am calling for is a lot more than what is proposed in the Schott Foundation report. But I think it is a far better start than calling for improved cultural practices or for another march on … whatever place fits us on a given day. Lester K. Spence teaches political science at Johns Hopkins University.